By sabine, June 17, 2005 at 9:15 am . 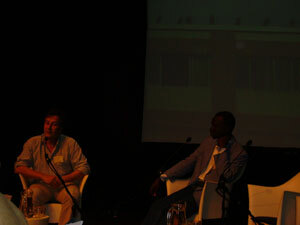 François Laureys (IICD) in conversation with Sylvestre Quedraogo (Burkina Faso). In terms of ICT and ICT – use, Burkina Faso is a relevatively poor country. Not many people have access to internet or mobile phones etc. How is it to be on the other side of the digital divide? What is happening in reality in Africa? Sylvestre has 700 students and has to work with 5 computers: two Pentium I computers and three 486 PC’s. They came from Europe. They have no choice, they have to work in this conditions. The only thing they can do is to try to keep the material in good condition. The situation is that there are many computer rooms with high standard computers which have been donated by NGOs or Universities in Europe. But these are not being used, they would be vandalised. Also interests in the university have made that the computer rooms have been closed. What should be done at the level of university? The problem is the management. How to solve this? Other management in the universities. In Burkina Faso the educational system is a right. This system has to be changed, you should have to pay to have a good education. Are people willing to pay for training? Yes, they can and should pay something. You can get information for free but if you want to follow a course, you have to pay something. What happens if you give a course in very large and packed auditoria? The students can’t talk to you. You speak and go home as fast as you can because there is no way to answer all the questions. Sometimes the electricity is gone and you can’t give course anymore because you need the microphone. We saw some pictures of students playing games. They need to have contact with the computer, so why not just let them play games on it. How to organise these trainings? People need very basic knowledge in computers, write letter, send emails. Is there possibility for advanced training? Only if the person who asks this can explain why he really needs this. If not, the energy will be invested in basic courses. This is the situation in the city, but how about in the rural area? There is an example of a village where they have a mobile phone. In some villages only one phone is sufficient. The Digital Divide is not only about infrastructure and access, but also about how to use the tools.